Williamson County is the latest school district to push for safer school bus stops. Across Middle Tennessee, state crash data show 56 school bus crashes were serious enough to have injuries reported in 2018. FRANKLIN, Tenn (WTVF) — Williamson County is the latest school district to push for safer school bus stops. Across Middle Tennessee, state crash data show 56 school bus crashes were serious enough to have injuries reported in 2018. None were in Williamson County. A total of 32 were in Metro Nashville, 5 were in Rutherford Co and 3 each were reported in Sumner, Wilson and Lincoln Cos. 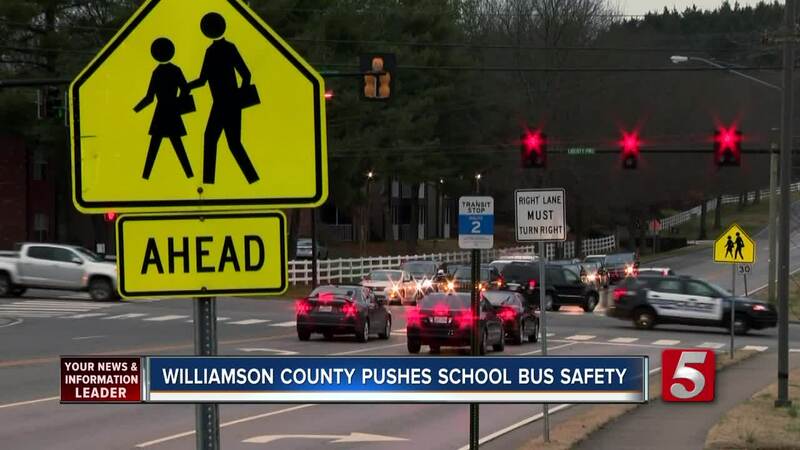 But Williamson Co knows its good record could easily change if drivers don't pay attention, and to a parent, there's nothing more important than their child's safety. "As a parent I worry something might happen to our kids or any of the neighbor kids," said dad Travis Bright, after seeing his son and daughter off at their bus stop Tuesday morning, "I've seen a couple of near misses in the neighborhood." At a different bus stop Angela Jacobus waved her two sons goodbye and told NewsChannel 5 the same thing. "Sometimes I absolutely do worry...we have seen quite a few (cars) that just keep on driving." Across Williamson County, the new enforcement push has more police and deputies on the lookout for drivers behaving badly near buses. Officers are asking for the public's help to report dangerous drivers and even record them or take a photo if possible. It's the latest in a string of efforts to keep kids safe on school buses across Middle Tennessee after a series of fatal bus stop crashes drew national attention in the Fall. In November, Mt. Juliet Police announced an enforcement campaign that netted 30 citations in just a week and a half. "It involves children, it involves their lives and we care about the safety of kids," said Brentwood Traffic Enforcement Officer Bryan Kirkpatrick. He says he and other officers will patrol known problem areas like bus stops and school zones whenever they are not on other calls. They rely heavily on complaints from parents and bus drivers to target certain areas. School transportation staff say routes tend to be most dangerous in the mornings and on rural roads, where people aren't expecting to see a bus and may not be paying attention. Williamson Co says the first wake-up call came last Spring, when bus drivers were asked to count the number of drivers who illegally passed while buses were stopped. In one day they reported 18 incidents just in Williamson County. "That is one of the most consistent issues we do have not only in our county, but nationwide," said Williamson Co Schools Transportation Director Jeff Fuller. The district hopes a series of videos, tailored for each city, will encourage people to keep the county's good driving record intact. Those videos will begin going live on the school district's Facebook Page and Youtube channel along with each individual police dept page in the coming days. The message: pay attention. It's hard to miss the large yellow buses. And make sure you stop when they do. Officers know some people simply don't understand the law. "As long as there's not a permanent divider between the lanes, if it's paved left to right when the bus stops and the bar's extended, everybody has to stop (in both directions)," said Traffic Enforcement Officer Joe LeCates with the Franklin Police Dept. But in case the videos don't convince people to change their habits, law enforcement will be ready. "We need to try to catch some of these people too, to try to make believers out of them," said Williamson Co Sheriff Chief Deputy Dusty Rhoades. Parents say they're on board with this route. "I think that's great," said Angela Jacobus. Because everyone with a little one knows there's nothing more important. "It only takes a split second for something to go wrong," said Travis Bright.